All nShield HSMs integrate with the unique Security World architecture from nCipher. With this proven technology, you can combine different nShield HSMs models to build a unified ecosystem that delivers scalability, seamless failover and load balancing. The power to utilize existing data backup, replication and file sharing practices to safely and automatically perform application key sharing, distribution, and back up—dramatically simplifying HSM deployment and management tasks by minimizing the need to establish costly HSM specific practices. Standard application interfaces to support the widest range of applications and systems and an extensive pre-testing program with leading application vendors to minimize deployment risk. Cryptographic acceleration and off-load to remove resource intensive operations from client machines, boosting overall performance and maximizing capacity. Unlimited capacity for protected key storage, increasing overall scalability. Back up techniques that avoids the need to archive keys in dedicated hardware or costly backup HSMs. Fault-tolerant chassis design includes dual hot-swap power supplies and redundant field-serviceable fans. The ability to combine multiple HSMs to create a highly resilient network for load balancing and failover. Remote control to enable key custodians and administrators to perform duties in a secure fashion, reducing cost and inconvenience. Remote provisioning of CodeSafe-protected applications (option). The nShield Solo is available in PCIe form factors. The nShield Solo is available in multiple performance variants: the 500, 2000, 4000, and 6000, which indicate their signing transactions per second for 1024 bit RSA. 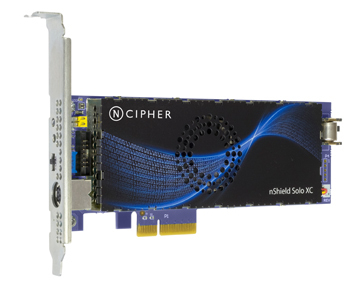 Additionally, model PCIe 6000+ is optimized for high performance elliptic curve cryptography (ECC). Please consult the nShield Solo data sheet for additional performance data. The nShield Solo is available in FIPS 140-2 Level 2 and FIPS 140-2 Level 3 variants. CodeSafe enables application developers to write programs that are securely loaded within the secure environment of an nShield HSM, protecting them from threats such as insider attacks, malware and Trojans that they would otherwise face on typical server platforms. CodeSafe provides an application “sand box” where code can be validated for integrity and authorized to execute in a tamper-resistant manner—ideal for applications residing in untrusted locations. The secure execution capability provides additional security features to enable fine-grained access control and authorization for the use of security critical resources that are protected on the device, such as private keys, non-volatile user memory, and hardware-secured time. Examples include digital meters, authentication agents, time-stamp engines, audit loggers, digital signature agents, and custom encryption processes. CodeSafe is available for all nShield FIPS 140-2 Level 3 certified HSMs excluding the nShield Edge. With the CipherTools Developer Toolkit, developers can take full advantage of the advanced capabilities offered by the nShield HSM family when integrating HSMs with custom applications. It includes detailed tutorials and reference documentation, sample programs written in a range of high level languages, and additional versions of libraries to expand capabilities for integration with business applications beyond those that can be achieved by the standard application program interfaces (APIs). nShield HSMs offer a large number of cryptographic algorithms as part of the standard feature set, including AES, DSA and RSA. For organizations wishing to use elliptic curve cryptography (ECC), an ECC Activation license is available. The optional activation license enables ECC operation on allnShield Solo and Connect models. For organizations that require significantly accelerated ECC, two additional nShield models are also available. The nShield Solo PCIe 6000+ and nShield Connect 6000+ deliver hardware-optimized ECC performance and come bundled with the ECC Activation license. Databases often contain an organization’s most sensitive data. As a result, major database vendors have implemented native encryption in their database server products. The nShield Database Security Option Pack adds support for Microsoft’s Extensible Key Management (EKM) API. It enables organizations to better protect keys that protect sensitive data in Microsoft SQL Server 2008 deployments utilizing Transparent Data Encryption (TDE), manage keys across multiple databases and systems, and separate key management and database administration. Users of Oracle 11g TDE can take advantage of these features without requiring this option pack. HSMs typically run in physically secure, lights-out data centers, often at several, redundant sites. Many organizations therefore find it impractical to gain physical access to the HSM for day-to-day operations. Remote Operator saves time and reduces travel costs by enabling users to present credentials to a remote HSM in a secure manner directly from their workstation. Highly sensitive areas of government and enterprises with a strong interest in national security sometimes prefer to use proprietary, national cryptographic algorithms to protect their most sensitive information. Given these security concerns, it is advantageous to run such algorithms on a secure HSM platform. The KCDSA Activation enables South Korean agencies to use the Korean Certificate-based Digital Signature Algorithm (KCDSA) on an nShield HSM. nChiper recommends CodeSafe technology to organizations that wish to implement their own national algorithms on the protected HSM platform. For organizations deploying one or more nShield Solo modules in a 19″ rack, the optional nShield Smart Card Reader Rackmount provides a practical and tidy solution to attach card readers in the data center. The nShield Smart Card Reader Rackmount is 1U in height and can be equipped with up to four smart card readers, which are shipped as standard with nShield Solo cards. Each unit is shipped with three blanking plates to cover any unused slots. Below is a non-exhaustive list of applications that utilize these APIs and have been tested by nCipher partners and/or customers.